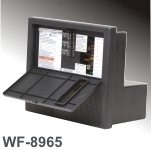 The WF-8900 Series has revolutionized RV power centers with its lighter weight, decorative doors and superior features. The WF-8965 model provides 65 amps and a clean, constant 13.6 Vdc nominal output, for reliable operation of electronics and appliances. Automatic three-stage charging extends the life of your battery with output voltage modes of 13.2 Vdc “float” mode, 13.6 Vdc “absorption” mode, and a 14.4 Vdc “bulk” charge mode. The 8900 Series also maintains peace and quiet, as the cooling fan runs only when needed. Front-cooled fan installation does not create additional installation space requirements. The 8900 Series models provide AC and DC distribution with innovative features. They can accommodate a 30-amp main AC circuit breaker and up to five branch circuits. Eleven-branch DC circuits are available with LED lights for each DC circuit to illuminate and identify open circuits. Front cover window allows for a quick visual check of the fuse LED lights.